It was January 2005, and then-Flagstaff City Councilmember Joe Haughey and his wife were driving up from Phoenix when one member of a large herd of elk jumped out in front of their minivan on Interstate 17 near Munds Park. Photo credit: Josh Biggs/Arizona Daily Sun. Jeff Gagnon of Arizona Game and Fish stands by one of the fences that was put up along I-17 to deter elk from entering the freeway. “If it’d been a bull, I might not even be here today. The horns would’ve come right through the windshield,” Haughey said of the accident. He landed in the hospital for a night, but his wife Liz needed spinal surgery and suffered injuries to her neck and eyes, and a broken nose. The couple received a number of calls from other people in Flagstaff who had hit elk, and they pressed the Arizona Department of Transportation to do something to keep elk off the freeway. Ultimately, they opted for litigation to force ADOT to address the issue and pay for some of their medical bills. “We hoped that because we filed a suit, we brought it to their attention, and they might do something about it,” Haughey said. The state ultimately settled out of court, but it has now added a 6-mile-long, nearly 8-foot-high fence to keep elk off I-17 near Munds Park — the place where GPS tracking had indicated the most elk cross the road. Plans for the fence, and applying for grants, started in early 2008. There have been zero elk-vs.-vehicle collisions in that stretch since the fence went up early this year. “We recognize the need to improve the safety for the traveling public on that section of the interstate because that was one of the areas of the most accidents on I-17,” said Chuck Howe, an environmental compliance manager for ADOT. It is also a matter of numbers. Accidents in this stretch of the roadway used to cost $350,000 to $400,000 per year in medical bills, vehicle damage and for cleanup. ADOT spent about $1.5 million building the fence, funded by the Federal Highway Administration. An elk-vs.-vehicle collision costs about $18,500, on average, per national estimates from the Federal Highway Administration. The Arizona Game and Fish Department recorded about 80 such accidents along I-17 from Stoneman Lake to Flagstaff, on average, in some years. Adding deer accidents to the mix, the costs for human injuries, deaths, vehicle towing and repair and animal removal on I-17 can be as high as $1.7 million per year, said Jeff Gagnon, a research biologist at Arizona Game and Fish. The high fences are aimed at persuading the elk to cross at canyons and underpasses, like Woods Canyon and Munds Canyon, Gagnon said. “We know wildlife pass through these features,” he added. Dirt piles on the freeway side of the fence are one-way ramps that help any elk on the wrong side of the fence jump back toward the forest. 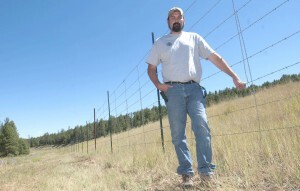 It’s possible this fence could someday stretch from Rocky Park to near the Flagstaff airport exit, but there aren’t any immediate plans for it. The question of how wildlife live with roads is interesting to biologists, who suspect populations can be permanently divided by highways, making a group’s genetic pool much shallower. Pronghorn antelope, for example, are famous for their unwillingness to cross human-made roads and jump fences, to the extent that some ranchers now build fences they can slide beneath. Antelope almost never jump over fences, and this was made clear in 1967. About 94 inches of snow fell in one week near Flagstaff then, and 80 percent of an Anderson Mesa herd died attempting to move to lower ground. All were piled up against a barbed-wire fence, according to an Arizona Game and Fish study. Highway engineers, too, are increasingly concerned about how wildlife gets across major roads, Howe said. This last winter, ADOT noted multiple deer and elk collisions along Townsend-Winona and Silver Saddle roads, as dear and elk migrated between Mount Elden and the Turkey Hills. The agency put out portable signs in the area to warn drivers. “We’ve done a similar study on I-40 between Williams and Winona, so we’re considering our options there,” Howe said. If anything, data from collared elk is showing that the width of I-17 and the high volume of cars is actually a barrier to a lot of elk wanting to cross. That leaves the possibility that herds are good at using canyons, or are being segregated based on what side of the road they live on, Gagnon said. Whereas other state highways see thousands of elk make it from one side of the road to the other, tracking to date suggests that only several hundred elk each year make it across — or under — I-17. Cyndy Cole can be reached at ccole@azdailysun.com or at 913-8607.